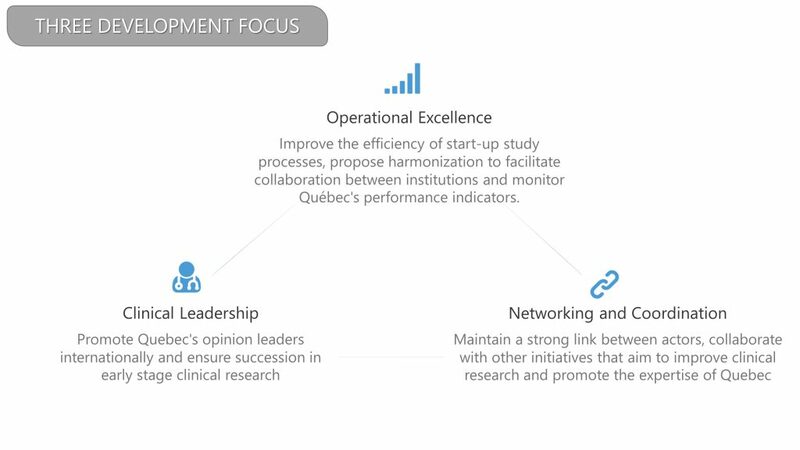 CATALIS is financed by the Government of Quebec by public and private partners to promote Quebec’s excellence in early stage clinical research. CATALIS is a collaboration of the various life sciences stakeholders whose objective is to increase the development of innovative treatments. CATALIS’ main focus is on early stage clinical trials (Phase I and Phase II, including Phase II-III) pertaining to pharmacology, biomarkers and biopharmaceutical devices and procedures intended for patients. These studies must be initiated by private or partially-private sponsors, i.e., those with sponsorships of 50% or more from private sources. Guiding short-term, mid-term, and long-term actions. Working in a common direction to efficiently achieve our goal. Putting tomorrow’s progress into play today.